This post is sponsored by BRÖÖ but all opinions and words are my own. I’ve always connected certain moments in my life with aromas from that day. I remember the calming smell of lavender at bath time when I was a child, and the invigorating aroma of citrus in a scented sachet in my mom's closet where she kept her exercise apparel. I remember the smell of rose as I ran through the sheets drying on the old clothes line in my grandmother's backyard and it still to this day leaves a smile on my face. And the smell of patchouli instantly takes me back to so many memories of a job I once had in the beauty industry in Dallas. Every fragrance has something attached to it, which makes it that much more special. I’ve always been one of those people that love lotion too. I don’t have a particular scent I always wear, but instead, have a handful that I switch between depending on my mood. I actually might be addicted to lotion. It would hands down be the one thing I would have to take with me to a deserted island if I could only chose a handful of things. So the time change is still kicking my rear end. And I just cannot seem to find enough hours in the day. The weather is changing too and these California temps make it hard to not just skip everything and meet my friends on a patio for a long long leisurely lunch that extends way into happy hour. My work load is keeping me very busy and I am so grateful but I am also remembering to create the time to do the other things that are important to me – like exercising, getting outdoors, reading, and just taking my time overall rather than rushing on to the next task. So I couldn't be more excited to celebrate and partner with BRÖÖ. They are a brand that I’ve admired and loved for a really long time now. BRÖÖ Moods, a line of Aromatherapy Lotions just launched exclusively at Walmart and on Walmart.com making it so accessible for every single person to have the opportunity to see how aroma therapy can change their lives! And it's so exciting because all products are made in the USA and all-natural (free of parabens, phthalates, dyes, synthetic fragrances, PEGs, polyquaterniums, phenoxyethanol and propylene glycol). I love seeing more and more eco conscience brands out there in my super markets! And P.S..the packaging is just so chic and fresh! I am such a sucker for great packaging! Could a scented lotion help with your many moods? Yes, BRÖÖ Moods Aromatherapy Lotions not only moisturize with barley and shea butter, but their aromatherapy oils also help you Unplug, Reboot and Sleep. They soften your skin while soothing your soul with their innovative (and free) BRÖÖ Moods App . BRÖÖ gets it---from checking smart phones 150 times a day, the excessive emailing---millennials often make vices of their devices. These digital natives are stressed, dragging, and so sleep deprived like zombies. 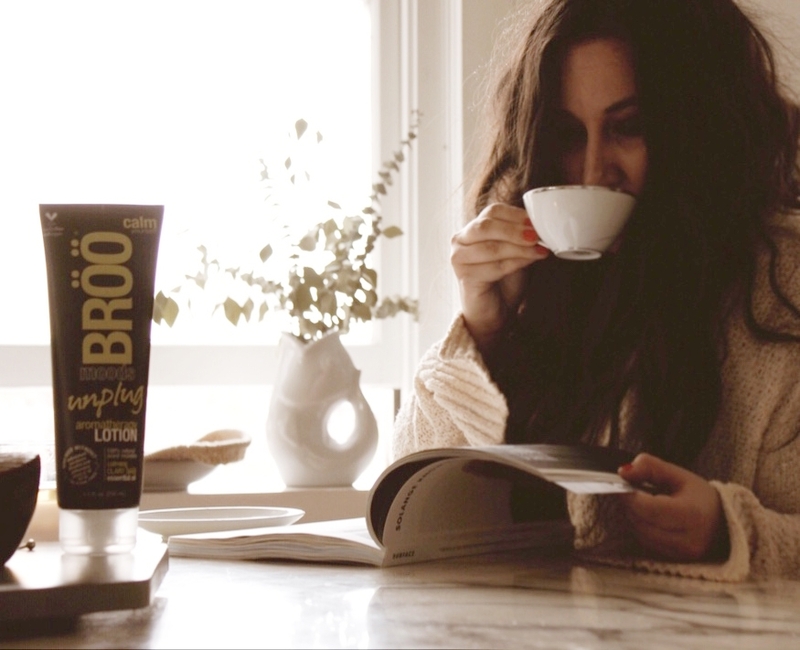 BRÖÖ Moods lotions embrace technology to improve millennials' modern moods, by serving up the world's first aromatherapy lotions powered by an App. I mean....how cool is that?!!! The meditation app (available at the app store) features a variety of music and sounds that can be paired with each lotion. So partnering with BRÖÖ Moods for their newest launch, I decided to share some tips and tricks to help you make a significant impact to your week ahead. Set your alarm 1 hour earlier than the actual time you need to wake-up. I know, it's going to be tough especially since it most likely will still be dark outside. But it will get easier the more you do this and make it a daily routine. Going to bed earlier and keeping that time consistent has really helped me with the earlier mornings, just FYI. Now you actually have some time to have a leisurely morning and not just jump directly into your day. I challenge you to not pick up your phone for that whole hour unless it's to use the BRÖÖ Moods Music App. No emails, no social media...just you, tea or coffee, a magazine, a book. Maybe stretch, meditate, or just watch the sun rise. I personally wake up and immediately start my day with BRÖÖ Moods Unplug Aromatherapy Lotion. It’s 100% natural scent is infused with essential oils of clary sage, lemon, juniperus virginiana, geranium, ylang ylang, bergamot, lime, orange, palma rosa, roman chamomile, olibanum and lavandin, for a truly aromatherapeutic, calming mix. I apply it liberally, then breathe inhaling and exhaling the amazing citrus, floral and woody notes. Oh em geeee it smells so good! And feels so good. I then meditate on my day and make some coffee. I also take 15 minutes or so to tidy up – An organized space is an organized mind and that alone calms me! I hate clutter. This hour makes me so much more productive in my day to day tasks and I can get so much done. The creative inspiration is just so free flowing. When the stress of any situation starts to appear and I begin to drag this is my signal that it's time to recharge and reboot. Get outside. An afternoon walk is one of my favorite things to do when I am needing to get re-energized. And my furry boys of course love the attention. I almost always find something new to admire in my Riverview neighborhood, and I get especially excited when this time of year because everything is in bloom. Tulsa is so pretty this time of year. I will also take the opportunity to go to a mid afternoon Pilates class. Pilates really gets my mind and body powered up and it's exactly what I need to conquer the rest of the day! On days I cannot go for a walk or get to Pilates I will just take a little break and do some jumping jacks and squats. Movement is such good fuel for the body. Here is where BRÖÖ Moods Reboot Aromatherapy Lotion comes into play. Its 100% natural scent is infused with essential oils of bergamot, litsea cubeba fruit, cedar, eucalyptus, lemongrass, thyme, tangerine, lemon, orange and patchouli, for a truly aromatherapeutic, uplifting breath of fresh air. Apply, breathe, and recharge as you inhale citrus, floral and herbal notes. It's like an instant shot of caffeine but better! I wrap up my day and now it's time to wind down and get some ZZZZ's. I use to struggle with sleep. I was a total insomniac. But now I end my night around 9 p.m. with some tea, television, and a good face mask. I usually drift into a deep slumber around 10 p.m and I even try to keep consistent with this routine even on the weekends. Sleep is so incredibly important to me - I need to get at least 8 hours a night to be a functioning human the next day - so anything that helps me get that beauty sleep is welcome. As hard as it is ditch the phone and any technology the last hour before bed. Write all your thoughts out in a journal.Writing down your to-do list will help you feel less anxious and more prepared for the next day. Read more. Go ahead and pick up those dusty books on the night stand. Maybe this is where you could meditate too. I am personally a morning meditator but make it work for you. I have a friend that goes for a late night soak in the hot tub before bed where that would completely not work for me, but it works for her. And embrace aromatherapy to the fullest and drift into dreams with BRÖÖ Moods Sleep Aromatherapy Lotion. It’s 100% natural scent is infused with essential oils of lavender, eucalyptus, tangerine, clary sage and lavandin, for a truly aromatherapeutic, tranquil slumber. I apply this each night and breathe in the sea salt, lavender and vanilla notes. Seriously breathe in and zone way out! I love the gentle rain sound on the BRÖÖ Moods Music App too. It's so soothing. Lin loves the sound of the campfire. I also want to highlight BRÖÖ Moods Connect Touch Screen Hand Cream for our digital hands. I personally need the moisture but then my phone screen and all my digital devices are just nasty from the residue on my hands. With the Connect Touch Screen Hand Cream you can instantly start creating those Insta stories because this cream instantly absorbs into the skin and is still deeply hydrating! It has barley, hops, Shea Butter and Butterfly Bush extract and will not leave your screens greasy or smudged. And, it’s 100% natural scent uplifts with jasmine and lime essential oils, to put you in a social mood! I love the way it smells!! I’ve found that with these small tweaks to my routine along with utilizing these fabulous aroma therapy products I’m not only more productive throughout the day but I’m also more present and focused. And even when we cannot change the stresses of life that come at us, we can change how we respond to them. And lucky you, I have partnered with BRÖÖ with a giveaway for one lucky winner to win this entire set of BRÖÖ Moods Aromatherapy Lotions!! 1. Follow me, @gofrenchyourself and @brooshampoo on Instagram. 2. Leave a comment on today’s accompanying Instagram post. 3. Tag a friend on that same Instagram post who would also love to win this giveaway. The more people you tag, the more chances you have at winning! 4. Leave a comment at the bottom of this blog post! * BRÖÖ giveaway runs from 12am CST, March 30th through 11:59 pm CST, April 3rd 2018. NO PURCHASE NECESSARY TO ENTER OR WIN. Must live in the US to be eligible to win. Winner will be contacted by me & their name will be published at the bottom of this post. Special thanks to BRÖÖ for sponsoring this post.